According to Ontario's Ministry of Environment, a consulting company continues to conduct surface water sampling several times per week near Shade's Mill Reservoir, Aberfoyle Creek and Mill Creek, following a jet fuel spill that took place several weeks ago. 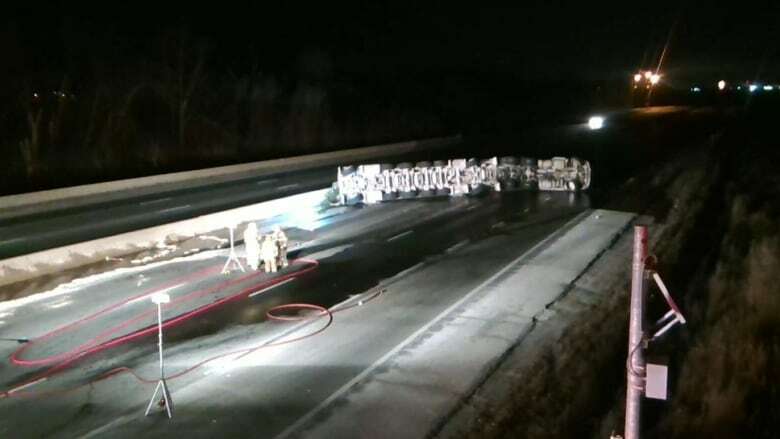 On Jan. 13, a tanker truck, carrying 50,000 litres of jet fuel struck a passenger vehicle in the 401 lanes and fell onto its side, spilling fuel all over the highway. Crews cleaning up jet fuel spill on Highway 401 east of Cambridge, Ont. Officials with the City of Cambridge said that the spilled fuel seeped into Aberfoyle Creek and has made its way as far as Mill Creek. The Region of Waterloo had to close down two wells as a "precautionary measure." The ministry says the consulting company is still assessing private property along Aberfoyle and Mill Creek for any potential environmental impacts. "To date, crews have not observed any fuel sheen past the Shades Mill Reservoir outlet and the ministry has not received any first-hand evidence of impacted wildlife," a spokesperson said via email. Crews continue to move contaminated soil from the site and transfer it to a soil remediation facility for disposal, the ministry said. The ministry said temporary barriers have been installed on the shoulder of the 401 highway eastbound for crews to continue the cleanup effort. The ramp to the eastbound 401 from the Hanlon Expressway has also been closed from Monday to Sunday, 10 p.m to 5:00 a.m. to get the work done. "Melting snow and warmer temperatures make it easier to complete the necessary work in the area of the spill south of the 401. Melting ice on the creek allows for improved visual observation along the creek system," the ministry said. The ministry said they've also been getting updates from the consulting company, that is checking and replacing the absorbent booms when necessary. The spokesperson said a detailed report on the actions that have been taken and what remains to be done will be submitted by the consulting company by the end of the week.